Welcome to China Ranch Date Farm! When traveling through the Death Valley area consider visiting beautiful China Ranch, near Tecopa California. China Ranch is a family owned and operated small farm, a lush piece of greenery amidst the forbidding Mojave Desert near Southern Death Valley. Imagine towering cottonwoods and willows by a wandering stream, date palms and abundant wildlife, all hidden away in some of the most spectacular scenery the desert has to offer. The Ranch is also rich in history. The Old Spanish Trail is within walking distance, as is the historic Tonopah & Tidewater railroad bed. Hike to nearby abandoned mines if you wish, or just relax and browse through our store. 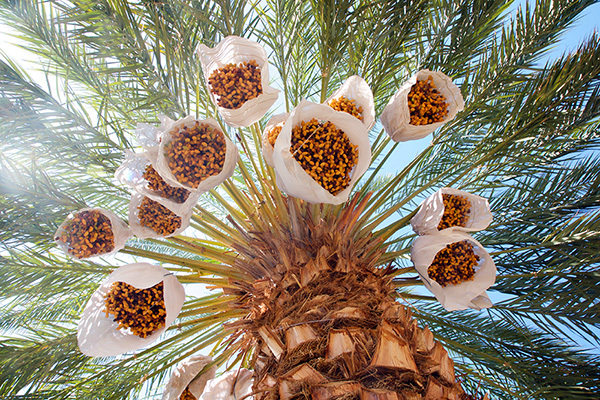 We offer several varieties of California dates as well as our own hybrids. Try some delicious date nut bread, muffins or cookies, or take home one of our unique hand-crafted gifts. If you are interested in learning more about the wildlife, plants or history of the area, try one of our interpretive guided nature walks. Learn about the geology, botany, birds, and early man in the area. The Old Spanish Trail comes alive again and much more. Visiting China Ranch can be a wonderful one day adventure or highlight of any trip to Death Valley. We are not a resort or tourist development, but rather a working family farm in a truly unusual setting. We are located 85 miles west of Las Vegas, Nevada, off Highway 127 en route to Death Valley National Park. Camping, motels and free natural hot mineral baths are available in nearby Tecopa Hot Springs and Shoshone. Order our delicious date products online for quick delivery or stop by to see what China Ranch is all about. Our shop is open 9-5 every day except Christmas! Copyright © China Ranch Dates, Inc.. All Rights Reserved.